Postcard? What the Hell’s a Postcard? I spent most of Wednesday up in Bristol for some ESPN meetings. At one point I was sitting in the office of Chris Ramsay, who’s the ESPN.com basketball editor (and also happens to be Dr. Jack Ramsay’s son), and I noticed a little publication on his desk. It turned out to be a Black Fives postcard booklet. 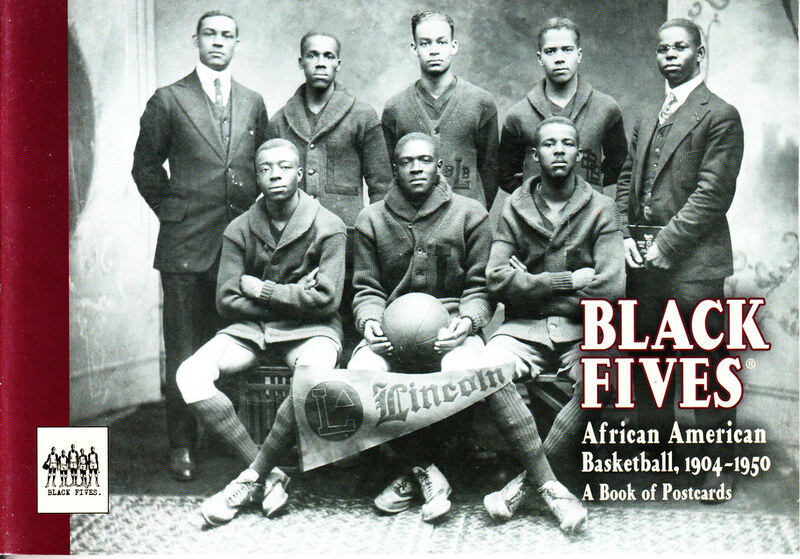 I think most of you know about Black Fives, right? 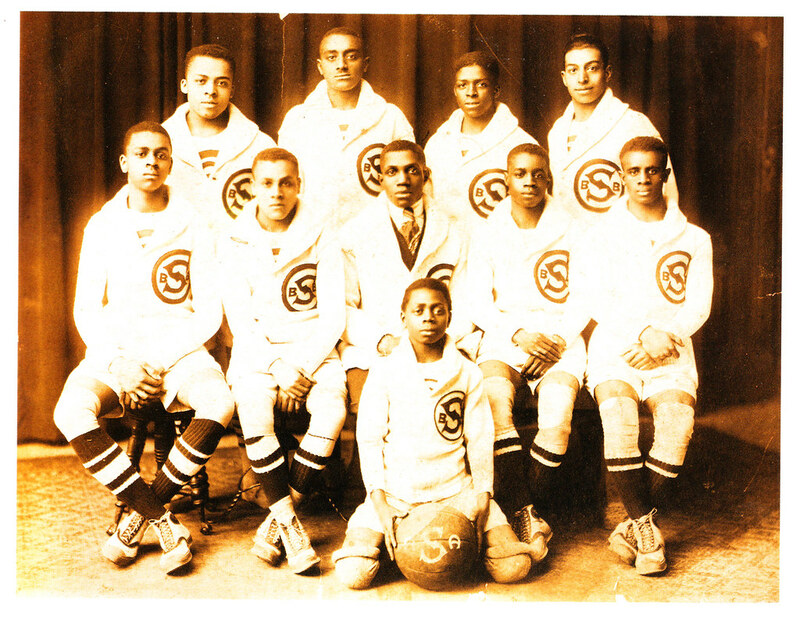 For those who don’t: It’s Claude Johnson’s ongoing project to celebrate, document, and, yes, merchandize early-1900s black basketball teams. Reader Nana Kwamie wore one of their jerseys to the Uni Watch party in Toronto back in 2007. • The biggest revelation for me is that many of these teams used warm-up sweaters. And not just any sweaters, but shawl-collared cardigans very much like the baseball sweaters used around that same time (and also very similar to classic curling sweaters). One shawl-collared pullover, too. I’ve gathered all the sweater shots into this set. • I’ve always been a sucker for jerseys with sash designs. 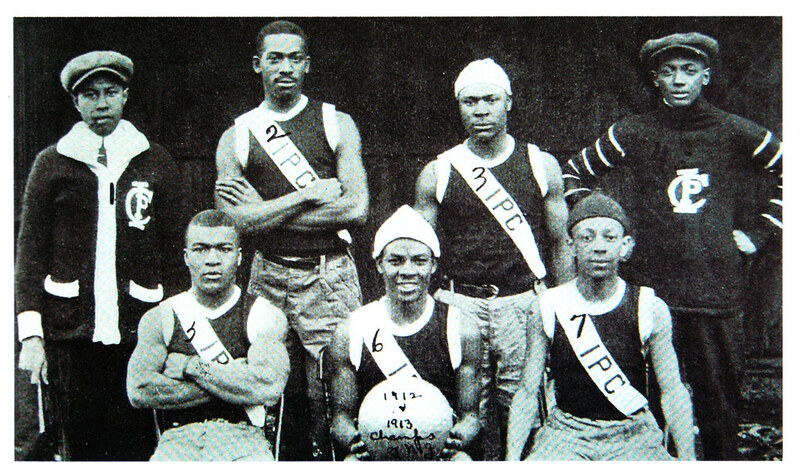 I suspect those sashes were just added for the team portrait (which is for the spectacularly named Independent Pleasure Club), but these look like they were a permanent part of the jerseys. • Several teams used jersey designs with a chest yoke with a center point, which I really like. Here’s a more acutely pointed example (with quilted shorts!) and a design that combined the chest yoke with horizontal stripes. 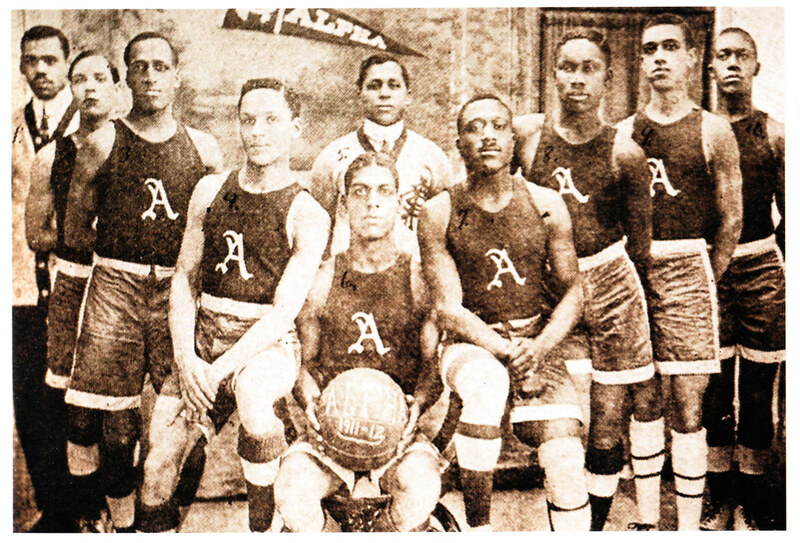 • The Alpha Physical Culture Club used a stylized “A” very much like the one used today by the A’s. 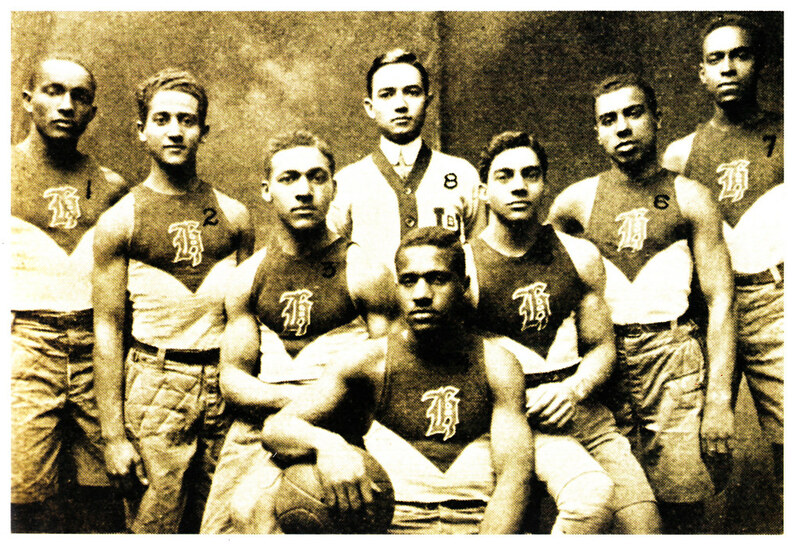 • As noted in the Uni Watch Glossary, northwestern stripes got their name from the 1928 Northwestern football team. 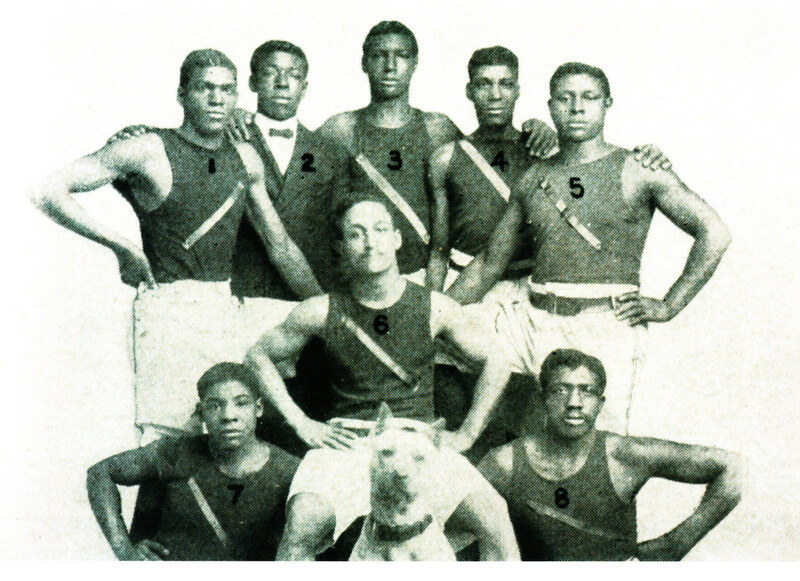 The basic concept of northwestern striping — a thick stripe bordered by two thinner stripes — clearly predates that team, as you can see on the socks in this 1915 team portrait. • Check out the second guy from the right — interesting that his knee pads aren’t plain like all the others, no? 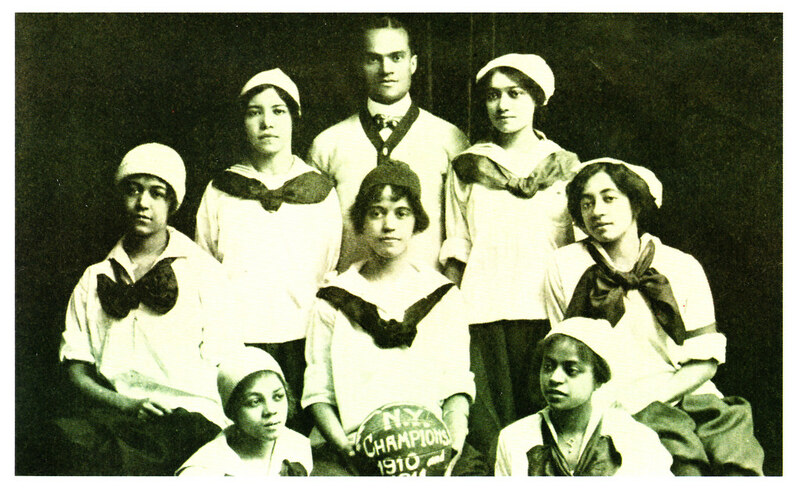 • Here’s a rarity: an all-black women’s team. • Here’s one more women’s squad. The rather chaotic looking chest logo stands for Spartan Athletic Club. The postcard booklet appears to be out of print now, but a copies are available here. Yellowjackets, Blue Jackets, varisty jackets: Yesterday I mentioned that Stewart & Strauss was running a sale on its chenille letters and numbers, which I thought would be of interest to DIYers. But even if you’re not into the DIY thing, S&S also has a nifty online tool that lets you design and purchase your own jacket. It’s just like one of those uniform-builder applications except it’s for a varsity jacket, allowing you to specify everything from the base color to the snap colors. Good stuff. Membership Update: We’re fully caught up on memberships. Every single order is now represented in the design gallery (including Peter Hymas’s Greg Lemond cycling jersey treatment, shown at right) and all but the last two designs in the gallery have been printed, laminated, and shipped. If you haven’t received yours, let e know. And if you want to sign up for membership, here’s where to do it. Also: Someone from Blue Springs, Missouri, sent me a $15 money order, presumably for a membership payment. But I couldn’t read the person’s signature and there was no note enclosed with the payment, so I have no idea who it was from. If this sounds like you, please speak up. Thanks. Uni Watch News Ticker: While driving home from Bristol on Weds. night, I listened to the Yanks/Nats game on the radio and heard something odd: Instead of assigning high uni numbers like 79 and 93 to non-roster scrubs, the Nationals just double up on the more traditional numbers. In other words, they had two players wearing No. 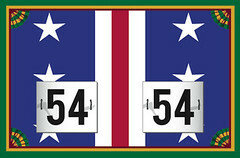 15, two players wearing No. 27, and so on. I’d never heard of this before. Do other teams do this? ”¦ Here we have what is arguably the greatest stripe-o-rama photo ever (great find by Don Gale). ”¦ The NFL is tweaking its uni number regulations (as noted by Brinke Guthrie). ”¦ Great gallery of early Wayne Gretzky photos, including many of the uniforms he wore while he was a kid, here (with thanks to Ian M.). 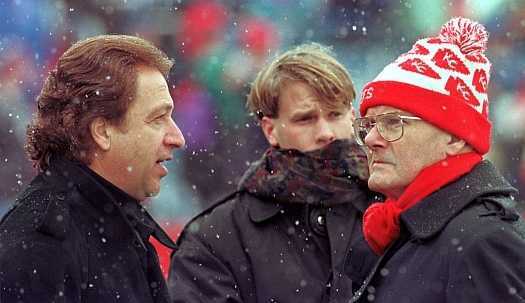 ”¦ Dig Lamar Hunt’s groovy Chiefs stocking cap (cool find by Jason Gomez). 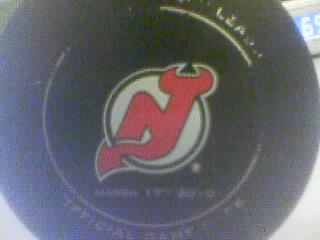 ”¦ It’s hard to see in this photo, but the Devils used a throwback puck, as well as throwback uniforms, on March 17th. The parts of the design that are usually black were green (with thanks to Kevin Clark). ”¦ John Donovan recently scored this gorgeous varsity jacket. Interesting to see the name embroidered on the sleeve instead of the chest — don’t see that very often. ”¦ Looks like Frosty has a new DIY client: one of Vince‘s co-workers. 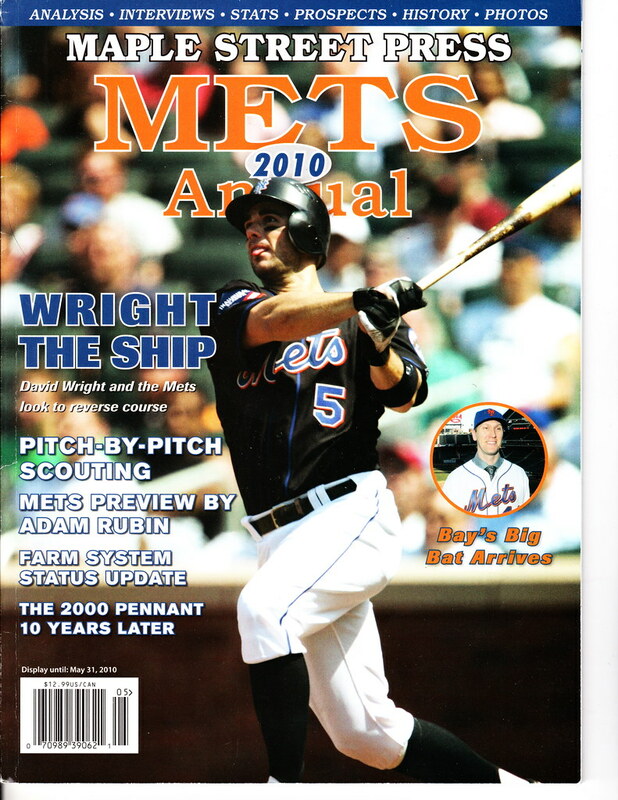 ”¦ No surprise that David Wright is on the cover of Maple Street Press’s 2010 Mets annual. But it is a surprise that they chose a photo of him wearing stirrups. ”¦ “The Columbus Blue Jackets have done the world’s laziest redesign to their new AHL affiliate, the Springfield Falcons (formerly partnered with the Oilers),” writes Erik Gallant. “But at least they’ve mastered the ‘Paint Bucket’ tool in Photoshop.” ”¦ Weirdest logo creep development in quite some time: Former Oasis singer Noel Gallagher has had an Adidas logo on his guitar lately (good spot by Andy McNeel). ”¦ Some really nice curling sweaters on display in this video clip (with thanks to Jim Vilk). ”¦ New alternate uniform for the Tohoku Rakuten Golden Eagles (courtesy of Jeremy Brahm). ”¦ Also from Jeremy: New clash jersey for the Brisbane Lions. … Someone on the Chris Creamer board has performed a valuable public service. ”¦ Totally digging the design on this old Westinghouse curtain. 100 comments to Postcard? What the Hell’s a Postcard? 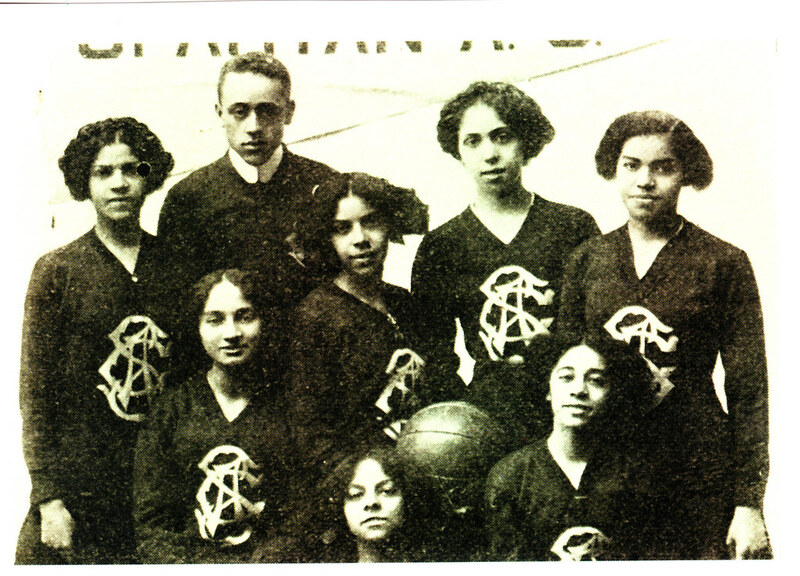 – Here’s a rarity: an all-black women’s team. one would assume the tall gentleman in that photo is the coach, yes? This is another one that should probably go in the FAQs. Good call. I’ve always vastly preferred the cap version. With regards to the ticker item of the Nats doubling up numbers instead of using high numbers…. SHOULD it be a surprise that the Nats do something that stupid? I mean this is the same team who is reusing a Squigle “W” for a logo, then cant spell their jersey names right and the biggest abortion of there’s, NOT keeping the Expos numbers retired and forgetting there history! So should this be a surprise? It’s unfortunate that the Springfield Falcons ditched their uni’s in favor of just going with the Blue Jacket’s system. Always like those even if they did have the goofy Falcon Claws on the bottom of the sleeves and the fact that all the players wore the Edmonton Pants. That Orange piping never seemed to work with the Falcons powder blue. At least Columbus has a nicer uni design than say the Kings or Carolina. At least we still have a team. Last Saturday, when the Pirates played the Orioles the Pirates had someone else wearing Akinori Iwamura’s 3. I think what happens is that these “scrubs” minor leaguers they call up for a few days just to use late in games get to have normal numbers because they weren’t part of the true major league spring training. 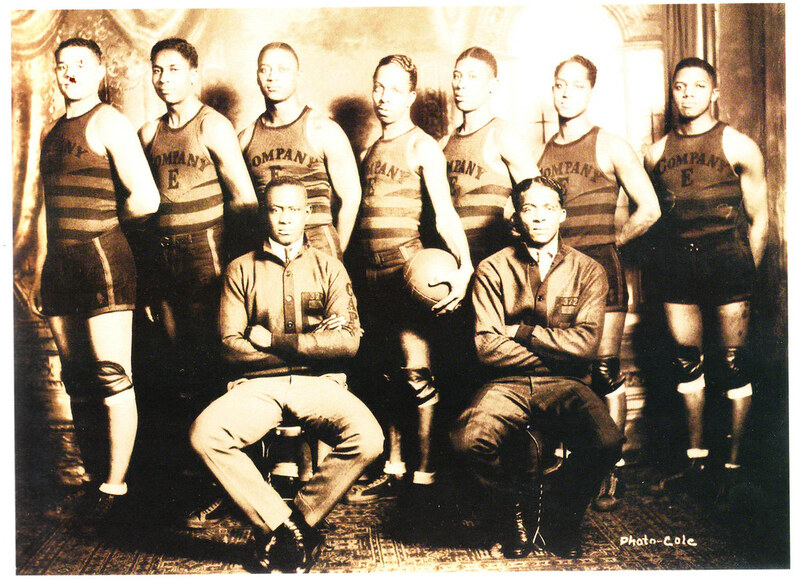 i didn’t know eddie murphy time-traveled back to 1913 to play basketball. Not sports related, but definately in the “advertising where it probably doesn’t belong” category. The jacket is also different. Nah. Pretty sure that’s Charlie. I like the hat the best. The crossbar on the ‘N’ is a little straighter, not as wavy. And the ‘Y’ isn’t as rounded like a wine glass as it is especially on the jersey. Wow. Those are some great early pictures of The Great Guy! Actually Eddie Murphy all those players are Eddie Murphy. Dammit, ruined my joke with a typo. Let’s try this again: Actually, all those players are Eddie Murphy. That looks exactly like the jersey logo. What difference do you see? how is that logo affixed? Is that even the real deal or just a mock-up? Either way, it really is a great logo. There’s a certain charm in using two slightly different logos for cap and jersey, but the Yankees just take it overboard. Drop the print logo completely (which isn’t on any on-field gear anyway) and match the batting helmets to the caps. Looks like a Photoshop deal there? oops… nevermind, i read that wrong. Regarding NFL numbering article, I was under the impression that 50-79 was long thought of as an acceptable range for any OL. For example, the last four Steelers’ centers (Hartwig, Mahan, Hartings, Dawson) all wore/wear numbers in the 60s. Is this something that was just relaxed and not enforced (although I find that hard to believe in the No Fun League)? [quote comment=”382960″]Regarding NFL numbering article, I was under the impression that 50-79 was long thought of as an acceptable range for any OL. For example, the last four Steelers’ centers (Hartwig, Mahan, Hartings, Dawson) all wore/wear numbers in the 60s. Is this something that was just relaxed and not enforced (although I find that hard to believe in the No Fun League)? [/quote]Centers are “supposed” to have numbers in the 50s, unless there aren’t any available. Teams are carrying so many linebackers these days and the vast majority of them have numbers in the 50s so there really aren’t many o-linemen at all with numbers in that range. Olin Kreutz and a guy (whose name escapes me at the moment) who was a rookie with the Bengals last year are the only centers with numbers in the 50s I can think of off the top of my head. Q: Why is Pedro Feliz wearing #77? Check out this beaut from this weekend’s Heritage Auctions offerings. 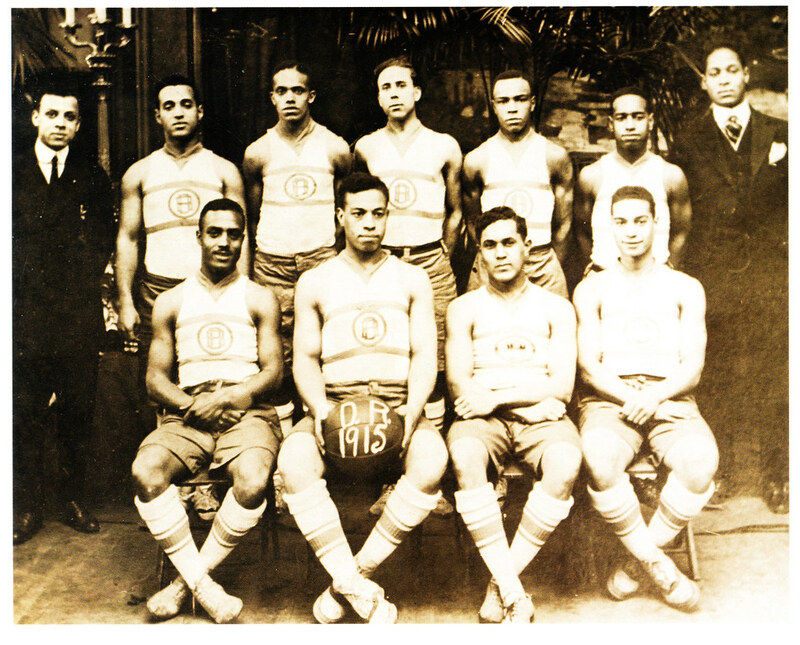 A 1940s “M_____ Power & Light Co.” team uniform. The jersey is cool enough, but the real treasure is the cap. Reddy freaking Kilowatt! [quote comment=”382965″]Check out this beaut from this weekend’s Heritage Auctions offerings. 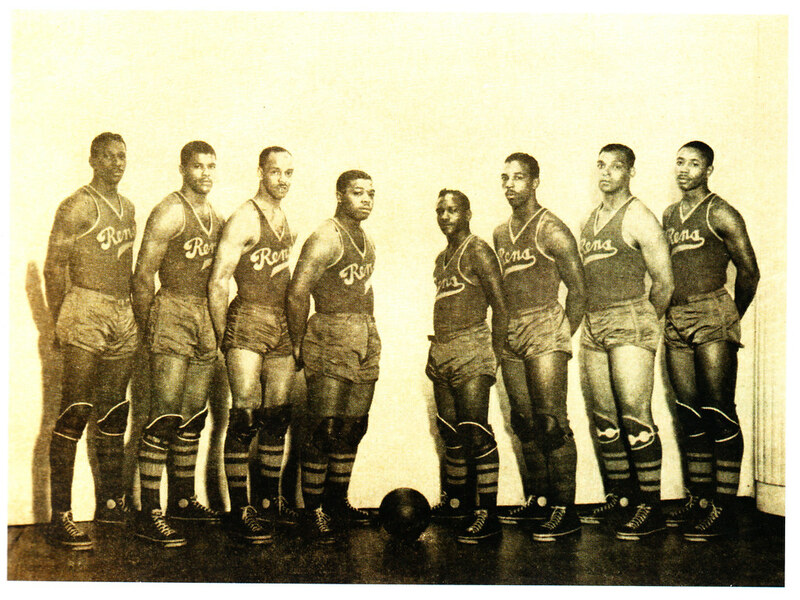 A 1940s “M_____ Power & Light Co.” team uniform. It’s affixed with Adobe Photoshop, and a little bit of elbow grease. The Great One and his wife Janet graced the 1998 Sports Illustraded swimsuit issue. 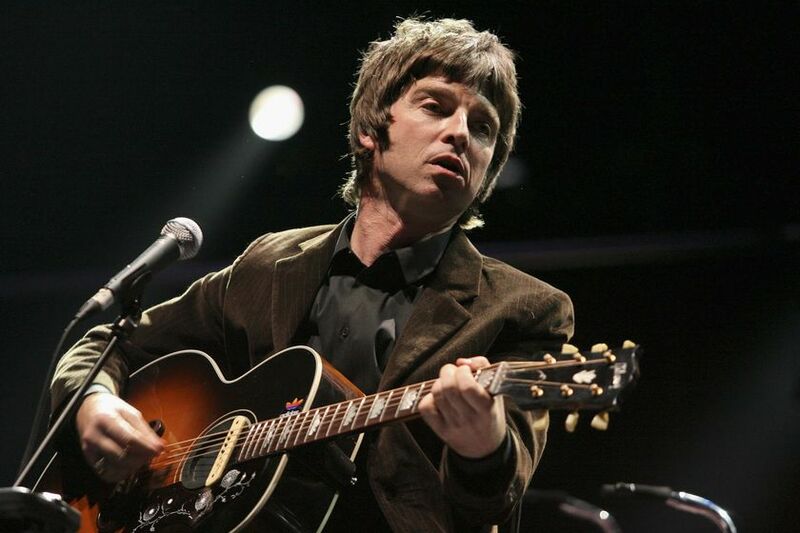 In regards to the Noel Gallagher Adidas logo creep on his acoustic guitar, he has had the small “classic” Adidas logo on his acoustic guitars for quite some time. I believe you can even go back to the late 90’s and see the logo on his acoustic guitars. To my knowledge (and I’m a HUGE oasis and Noel fan), he has never had any logos on his electric guitars. But that’s the first one that I’ve seen where it’s a mult-colored logo. Couple of Tennessee basketball notes here. Nothing major. First off, since the Lady Vols have added the NCAA patch to their jerseys for the tournament, their jerseys look very cluttered. The patch above the SEC logo there is a Vol Scholar patch, which is awarded to players who meet a certain academic standard, so not everyone has that one. Second, unless you’re a Tennessee fan this whole video may not look all that great to you, but at the end there’s a few shots of some of the managers putting the NCAA patches on our orange jerseys. I thought it was pretty interesting. Hopefully all the HTML coding worked there. I haven’t done any in a while, so please bare with me if it doesn’t end up working right. The second guy from the right in this picture of the Alpha Physical Culture Club sure looks like President Obama to me. You’re right – way too cluttered. Howasbout we remove the American flag? Surely anyone who’s earned a Vol Scholar patch can remember what country they’re in. The new Springfield Falcons logo just proves that western MA is still basketball country. Because I live there, it will be interesting to see the reaction. I’ve been browsing through a set of Life photos about Ohio State University in 1948. It’s only tangentially related to unis so you may wish to skip these links. 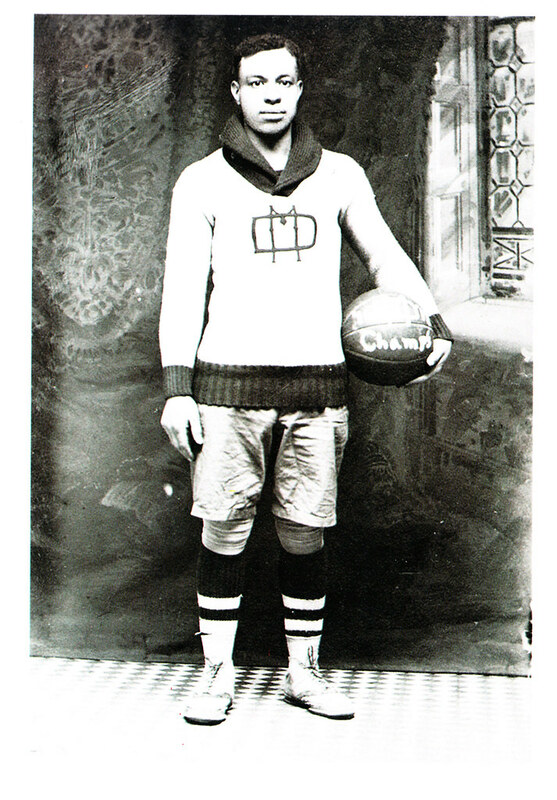 The OSU practice uniform and a close-up. Love the Black Fives photos, but the logos are even better! Not only does the Smart Set Athletic Club of Brooklyn have a fantastic name, but their logo kinda reminds me of one of my all-time favorites, the Arsenal art deco logo. Hell, even the SSAC crest looks like the inverted crest of the new Arsenal logoM – which while I understand why they created, still doesn’t trump the classic. For the ‘sneakerheads’ that are out there (and I know there are a few) here is an article on Time.com about the big Chinese athletic shoe company opening up a west coast store to jump into the U.S. market. I think you might be reaching here. The jersey “NY” is taken from a picture of a player in motion and is therefore a little warped. Looks like maybe the first version was created when someone traced around a navy logo yet to be sewn onto a jersey on white fabric…and then left the pencil lines in, instead of cutting them off, when cutting out the white version. That’d make every part of it the width of a pencil line bigger. I know cuz I’ve made the same mistake. You trace it backwards on the BACK of white fabric so you don’t have to remove pencil marks from the front. But, if you aren’t careful you get a version slightly “fatter” than the original. [quote comment=”382981″]Love the Black Fives photos, but the logos are even better! As a longtime Arsenal fan, I miss the blackletter. But other than the wordmark I really prefer the new crest – the other one always bothered me as being too busy. Maybe it was the ermine, running into the wordmark. Nothing, but nothing, beats the Art Deco Crest. Glad to see Arsenal’s finally realized the value in merchandising it. aaaaaaaaaaaaaaaaaaaaaaaaaaaaaah…he says as his brain sinks into a warm pool of sweaters. [quote comment=”382985″][quote comment=”382981″]Love the Black Fives photos, but the logos are even better! Miami FC (division II soccer) unveils its new uniforms. And those might be those guys’ minor league numbers. I’d rather see a couple guys wearing #3 than one guy wearing #85. Yes, White Sox, I’m looking at you. Harold Baines might disagree with you there. If the Pirates had a couple of guys wearing #3, that’s better than a guy wearing #85, to me. Only the second part was directed at the White Sox. Baines, incidentally, is wearing his #3 as he’s a coach. I’m not exactly sure what was meant by that comment. How is western Mass basketball country, exactly? Because of the Springfield Armor? Ha. why the orange sock? looks odd seeing the orange sock under those Colt 45 stirrups. Re Nats’ duplicate spring training uniform numbers: I don’t know if it’s unique or a first, but it’s nothing I’m getting worked up over. Doubling up numbers happens all the time on big college football teams. If Washington MLB v3.0 had a winning tradition I don’t think that, or their jersey typos, would be such a big deal. Astro’s pitcher Bud Norris was again forced to change his glove while on the mound. this time he was apparently using a glove that was “too bright” accordign to the home plate ump and was forced to switch to a black glove for his start. That’s just the natural copper glow of Phil’s new artificial tanner. He’s actually sockless. I’m totally confused by why the Yankees have 4 slightly different logos. They’re a billion dollar corporation. Any corporation even near that size has like 50 pages in their brand identity manuals, and every tiny part of the logo is specified, measured in perfect detail. When I have worn my stirrups to work on Fridays, it’s been easier to go with the white sany because we are allowed jeans and sneaks on Fridays. Now, with that said, I wear the stirrups all weekend but I am not allowed to roll my jean cuffs high to show them off. My wife will not let me go that far with them. For example, Tiger minor-leaguer Jeff Frazier wore his #12 in several Tiger spring training games, even though major league coach Lloyd McClendon wears #12 for the Tigers. There were other similar situations for the Tigers this year as I recall. In the old days (mid-80’s), the Tigers used to have a “Tigers 68” jersey (NOB “Tigers”, number 68) for the minor league guest of the day. that made it pain to figure out who the player was. The current system is better because you can tell who the minor leaguer is. It would be awesome is someone from the Uni Nation would win this and scan the pages so we could all enjoy the patches and the little history presented with them. i have no problem with this in the office, the point is the pain of the stirrup penance, not the fact that you are wearing the proper sani on stirrup friday, more on that subject sunday. i am thinking of putting together a coloured sani package, so that you could have exact matches for the office(or you could go navy) the problem is sanis both white and colour have minimums, so i can’t just go buying a thousand dollars worth of sanis to sell 3. but i am working on office related solutions to our stirrup needs. I’ve worked Spring Training Games in the past and a few times, players were called up from the minor league camp just for a game or two. Instead of assigning new uniforms they would just wear the minor league unis. In the Detroit Tigers’ case I believe all of their players wear the big team uniforms for spring training – both major and minor leaguers. Yes, it does. May have to get one for myself. also an acceptable stirrup friday look, no right and wrong in combos. if anything it is an excuse to mix and match. [quote comment=”383003″]I’m totally confused by why the Yankees have 4 slightly different logos. Because that’s the way it’s always been. The Yankees logos would have been hand drawn back in the day, leading to variations by different manufacturers of jerseys, caps, jackets and whatnot, and the yankees don’t like to change much. The hat is iconic and the jersey is iconic, so if you change to one logo, you screw up one or the other. Or both. Besides, somebody did a mockup before- it didn’t look that good. The logos are adapted well to what they’re on- the cap logo looks weak on the jersey, and the jersey logo looks like a mess on the cap. I think minimalistic is the wrong word here, cuz it gets perdy ornate with scripts. Raw, is a good word. 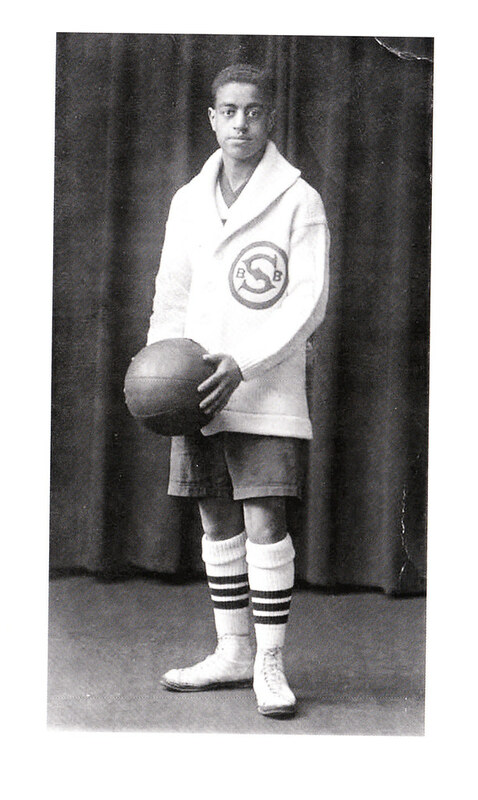 Because of the Basketball Hall of Fame, located in Springfield. The game is on CBS at 1pm Eastern, noon Central. I think there are probably far more baseball and football fans in western Mass than basketball fans. Unlike Cooperstown, which is very much defined by the Baseball Hall of Fame, the same most definitely can’t be said of Springfield. Capitalist overlords? I thought the Pajamists were our opressors. Anyway, it’s not so much the navy socks under the Oaks ‘rups. Had I gone with a different color shoe, all would have been fine. Unfortunately, I went with royal blue. Minimalistic…raw…both are accurate. Smart and Original come to mind, too. That St. Louis Gorillas floors me. wait…you mean not all stuff on the net isn’t true? /would love TO hear to say ‘i love my qb’ … wait…is he still ON the bills? Nice to see the Cooperstown Hawkeyes stuff for sale but…whatever happened to the high school that had the logos done by a uniwatcher? They had a storefront but the caps weren’t ready yet. I think it was the Sartell Sabres, maybe? I’m still anxious to buy a cap. i was going to say to james, yes the pajamist is our enemy, i think he was talking about his boss man, not the system. too funny. like i said yesterday, i am taking care of a neighbor’s cats, and one is sick so i have to give it some oral drops and a shot of cat steroids. anyway, i accidentally stuck myself with the needle today. i didn’t hit the plunger, but still, is that bad? am i going to chase bugs with extra gusto? recover faster from naps? You looking to score some catnip? I can hook you up. It may be homegrown, but it’s dank. Not like that schwag they try to pass off at Petsmart. i can’t believe it didn’t occur to me to work in catnip. i are dumb. Next Friday…..high cuffs. Come on, do it! Maybe a Youppi….with a baby blue sani…. Can’t wait for my Browns to get here! Maybe it’ll come with a free furball. That is right about the Tigers. They are one of the few teams who don’t wear their pajama tops–oops, batting practice jerseys–in spring games. I think Tigers fans would revolt if they did. In 1994 or 1995 I believe it was, the Tigers wore a blue jersey with the tiger-through-the-D logo for one Sunday home game. One game, that was enough for the fans to convince the team to never do it again. Stick with the stripes and the stirrups. What’s with the people in red shirts in St. Louis? They all appear to be wearing red polos and nametags, and they’re all around the court, not just where they would be seen on TV. Part of the NCAA’s “uniform courts”? 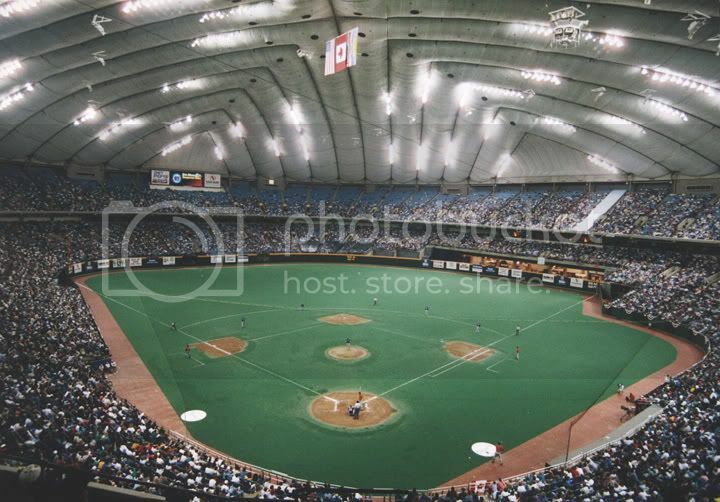 I do remember a while ago, someone posted a photo of the Tigers wearing orange in a game and we tracked it back to an exhibition game they played against Toronto in BC Place in about 1994. Da! I was blind to the fact that the stirrup was still being worn reguardless of the color of the sani. Phil, I proudly salute you. Why does Duke’s jersey hole design thing on the back of the jersey cover the whole back, but the other schools like Kentucky, Michigan State, etc. have only part of the back with a graphic design? Maybe Venus is considering switching to ice dancing?